Use the Format field option to make sure users provide information in the right format. This can range from phone numbers to postal codes to serial numbers, and much more! Below, you will find information on how to customize the format of a Single Line Text field and Phone Number field. Please note: If the format option is left empty in a Single Line Text field, no extra validation will be applied. 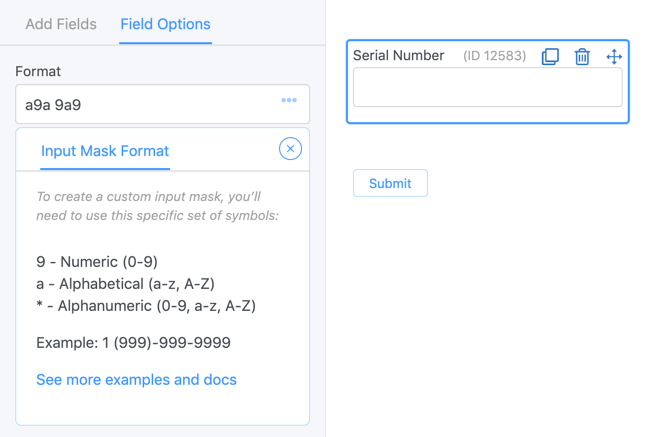 If the format field is left empty in a Phone Number field, the field will be validated to make sure a valid phone number has been entered. Determine the format that will be accepted by following the directions below. Go into a Single Line Text or Phone Number field's options. Type the preferred format in the Format box. Save your form and preview it. When you put your cursor into the field, you will see the input mask appear. Users will only be able to enter characters that fit the saved format. Require a phone number in the (999)999-9999 format. Require a properly formatted social. Require 4 lowercase alphabetic characters followed by any character. If the standard format options don't offer the flexibility that you need, use a regular expression to completely customize the format validation. Insert a regular expression beginning with ^ in the Format box. Please note that this will not add an input mask to your field. It will simply make sure the entered values match the format in your regular expression. If the entered values don't match the format, an error will appear after the Submit button is clicked. Require 99.9999.9999 or 99.99999.9999 for the phone number format. Disallow certain characters. The following example will remove a, 1, ", and '.